I have read the FAQ's and such like that I can find but I cant seem to explain what I am seeing. I have 2 jobs, one consists of 21 VM's and the other consists of 2. 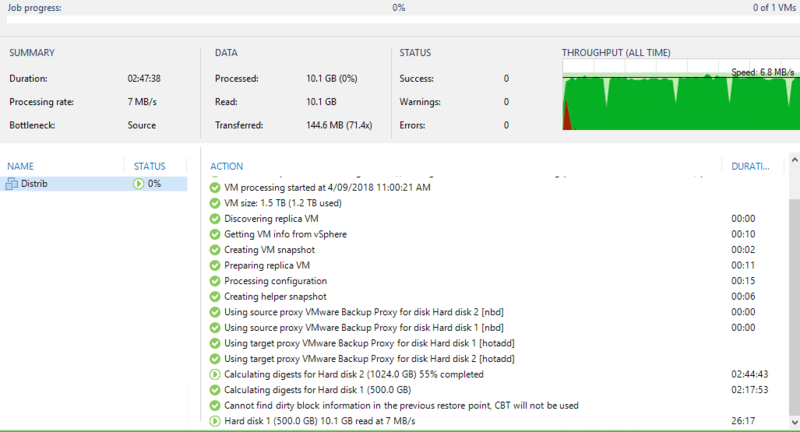 When I set the proxy selection for automatic and start the jobs Veeam has set the proxy for all the VM's withing the 2 jobs to the Server 1 proxy thus leaving the proxy on server 2 sitting there idle when it could be servicing a backup request. Other than manually setting the proxy, shouldn't Veeam try and use this Server 2 proxy when it has the same capability of Server 1? Also, it looks like the proxy is allocated at the time of starting the job? Given my main 21 VM job takes over 24 hours to complete, can I assume that what Veeam decides at job start is what will be used even though during the 24 hour backup? I have read http://forums.veeam.com/post39946.html#p39946 and it would appear that the logic would suggest that this proxy would be used but it is not. According to the logic. if you have 2 backup proxies using same mode with access to the repository, it should choose the one with least tasks assigned. If you choose the Backup Server 2 manually, is VBR backing up in SAN mode? It can be recognized by [nbd], [hotadd] or [Direct SAN] tag in the jobs` actions. aaron@ARB wrote: Given my main 21 VM job takes over 24 hours to complete, can I assume that what Veeam decides at job start is what will be used even though during the 24 hour backup? Correct, proxy selection happens once. To be more precise, proxies are assigned while there're free slots available, so not all the tasks get their resources right at the job start (provided the number of tasks in the job exceeds the number of concurrently available slots). Shestakov wrote: If you choose the Backup Server 2 manually, is VBR backing up in SAN mode? It can be recognized by [nbd], [hotadd] or [Direct SAN] tag in the jobs` actions. I will explain my backup jobs / repositories and proxy configuration further as to provide additional insight. Names have been changed to protect the guilty. Job 1 starts and all jobs sit at pending waiting for an available proxy, even though all tasks from ARBJedi are available as is all the repository slots from Repository 1. Most likely the second proxy is not capable of direct SAN access. Try to set it explicitly for one of the jobs and see what transport mode will be used. Please refer to my above post where I attached a picture of the job log where I manually selected the proxy as shestakov had requested, the proxy does have SAN access. Ah, it was not accessible at the moment I was replying, sorry for that. Then I recommend asking our support for assistance in logs review, the proxy selection details should be reflected there. Based on your reply the job should start working with the 2nd backup proxy rather than waiting for the busy one. As Foggy said the best you can do to investigate the problem is to review the logs with our technical support. Once you have a support case number, please provide it here for us to be able to follow it.